Professor Jean Christophe (JC) Desplat receives the title of Chevalier de l’Ordre des Palmes Academiques from the French Ambassador in Ireland, H.E. Jean-Pierre Thebault at a ceremony at Residence de France in Dublin. 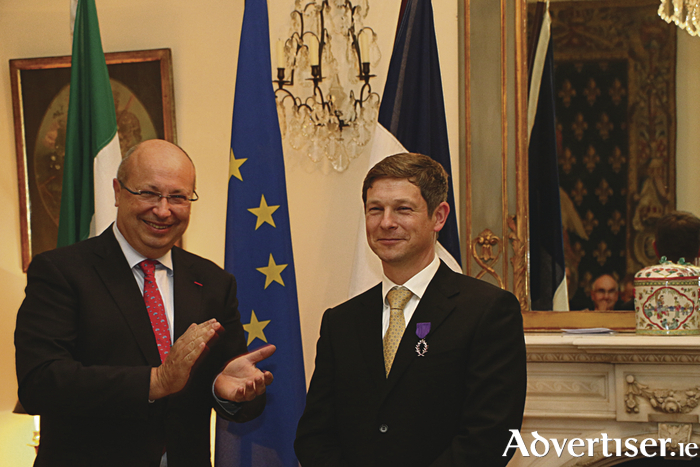 One of France’s highest honours has been bestowed on an Irish-based technology expert. Professor Jean Christophe (JC ) Desplat, Director of the Irish Centre for High End Computing (ICHEC ), which is hosted by NUI Galway, has received the title of Chevalier de l’Ordre des Palmes Académiques (Knight of the Order of Academic Palms ). The Ordre des Palmes Académiques is a prize given by the French government to honour distinguished figures in culture and education. Originally started by Napoleon, the award assumed its current form in 1955, and at a ceremony this week at Résidence de France in Dublin, ICHEC’s Professor Desplat joined the distinguished list of recipients. ICHEC is Ireland’s national centre for high-performance computing, with world-class expertise in the exploitation of next generation compute platforms. The Center operates the national High-Performance Computing service for academia and through industrial R&D collaboration helps bring the benefits of high-performance computing to business and industry. ICHEC is partly funded by the Irish State through the Department of Jobs, Enterprise & Innovation and the Department of Education & Skills. It is hosted by NUI Galway, with offices in Dublin and Galway. Professor Desplat has been an integral part of ICHEC since 2005, becoming Director in 2012. His expertise has proven crucial in establishing ICHEC as one of the leading technology centres in Europe. Speaking on receipt of this honour, Professor Desplat said: “I am honoured to be awarded this prestigious distinction by the French government. This award means a lot to me personally but it also rightly recognises the outstanding team of people I work with at the Irish Centre for High-End Computing (ICHEC ) where our goal is to make Ireland a world leader in high-performance computing. Professor Desplat is joining a high calibre of individuals through receipt of this award, joining the same ranks as esteemed politicians, scientists, historians, artists, musicians, and even royalty.